After his rooftop conversation with Ha-Ra, Sa Do-Chan strolls through the neighborhood and happens to pass a store selling honey rice cakes. This brings back a memory to when Do-Chan was ten. He and his father had executed a successful con together, his first one. When it finished, his father gave some rice cakes to him. Upon arriving home, he finds Baek Joon-Soo sitting in the living room, waiting for him. Joon-Soo tells Do-Chan that he changed his mind and believes that catching the criminals is a priority although he does not agree with their method. He believes that only Do-Chan can impersonate him and asks Do-Chan to assist them. So long as they pay for their crimes eventually he is willing to help. Sa Do-Chan accepts since Baek Joon-Soo asked so politely. Oh Ha-Ra interrupts and suggests that they both shake hands. Awkwardly, Joon-Soo extends his hand. Warily Do-Chan reaches out his hand and just as they are about to shake on it, he quickly pulls his hand away, requesting they go over the case first. A year ago, prosecutors Baek and Oh received a tip that members of some prominent families were throwing drug parties with models and actresses on a regular occurrence. Successfully obtaining a warrant to raid the venue, they surprised the drug-affected group. Unfortunately, only one was out cold, Park Young-Jin, a diplomat. The rest escaped. Park Young-Jin smuggled the drugs inside his diplomatic bag, on Grizzly’s order. Grizzly had spoken to Park Young-Jin, explaining that a diplomat’s bag is useful for bringing in drugs because they are void of inspections. With the desire to sell more, Geum requests Park bring the drugs in via a large sculpture next time. Park, realizing the jeopardy to his career, admits he is only smuggling the drugs because he was instructed by those in a higher position. He inquires as to Grizzly’s real name but is told that he doesn’t need to know. Unbeknown to Grizzly, before this meeting took place, Park wore a wearable surveillance camera and recorded the whole meeting. In this type of business one needs to have currency to bargain with. Park gave his friend Nam Seung-Tae the video and asked him to take care of it as if his life depends on it. After the drug raid, Park Young-Jin was taken into custody but was later found dead in a detention facility. A suicide note was found, stating that he had been tortured and had killed himself. In the prosecutors' minds, it was clearly murder. The person held responsible for the mistreatment of Park had to be the arresting officer, in this case Baek Joon-Soo. Baek was demoted and transferred to a position in Sokcho. However he, Chief Yang, and Oh Ha-Ra secretly continued their investigation. Baek Joon-Soo remains adamant that diplomats still import the drugs. Previously, Do-Chan infiltrated diplomat Cha Myung-Shoo’s phone data. Today, he and Ha-Ra begin their inspection of Cha’s diplomatic bag as he begins to depart from the airport terminal car park. Preventing the diplomats car from driving off, Do-Chan brings the prosecutors car to a stop right in front of the other car. They identify themselves to Cha and asks that he co-operates with them by allowing them to search his luggage. Cha demands them to cease and grabs the bag that Do-Chan already removed from the truck of the car. In the struggle the bag falls to the ground, and the sound of breaking crockery can be heard. On inspection, the prosecutors discover that the bag is indeed full of crockery and glassware. There are no drugs. The operation is a failure. Consequently, Supreme Prosecutor Jung reprimands them. Ha-Ra insists that drugs are being smuggled by diplomats and requests that the director let them investigate. When Jung asks what evidence they have, Ha-Ra replies that they need a warrant in order to obtain the evidence. Now with the warrant in hand, Ha-Ra and Do-Chan begin the next inspection. Again the airport is the venue and this time they have airport security and Labrador Retriever sniffer dogs with them. As the diplomats walk through the diplomatic terminal, Ha-Ra and Do-Chan, with serious looks on their faces, greet them revealing their warrant. As the prosecutors inspect the bags, the dogs show no signs of their trigger commands such as sitting or barking. There are no drugs in the baggage. However, there are multiple plastic bags full of red powdery substance. Upon inquiring, Ha-Ra is told by the diplomat that it is called Phrik Khinu. The diplomat continues, “It’s extremely…” but before he can finish his sentence, Do-Chan, in his haste to discover if this is a new drug, opens a bag and after dipping his little finger into the substance, pops it into his mouth. The diplomat, with a ‘serves him right’ attitude, informs everyone that it is “hot”. It is a kind of spice. Sa Do-Chan starts feeling the pang of the spice in his mouth. He struggles to maintain his composure but loses it entirely...and runs to the bathroom. Another failed operation. Do-Chan tries to excuse himself, telling Ha-Ra that he needs to go to hospital as he is allergic to spices. Showing his tongue to her, he argues that his tongue is very important in his line of work. He leaves her with an order that they are to search everything thoroughly. Sa Do-Chan slips away and visits Geum’s art gallery, the Feel Gallery. According to his source, Geum quit his job as a detective and now runs the gallery. On his way to the entrance, Do-Chan passes a worker pushing a wheelbarrow up the ramp. Do-Chan notices the contents of the wheelbarrow are broken pieces of a sculptured stone head. 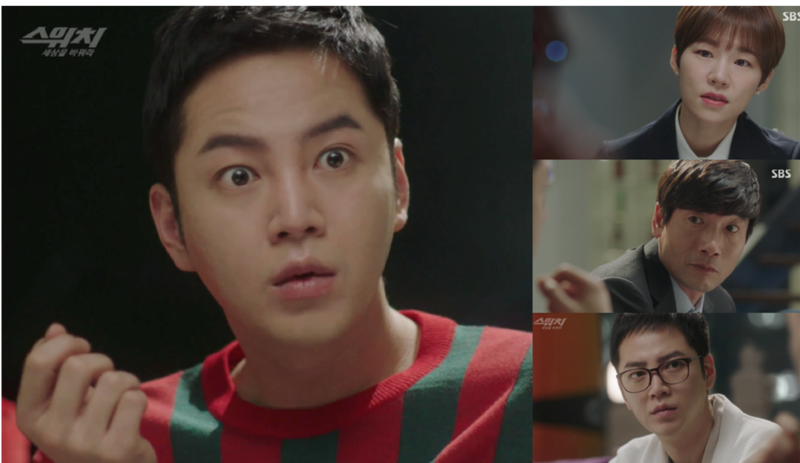 Surprise registers on Sa Do-Chan’s face as he sees Geum approach. He quickly flashes back to another memory. One where Geum enters into his childhood back yard, asking to see his father. Young Do-Chan shakes his head but soon bargains with Geum that if he buys him some jjajangmyeon (noodles in black bean sauce), he will tell Geum where his father is. As the boy is eagerly shoveling the noodles into his mouth, Geum tells the boy that he is very close to his father and he came because he is worried. Crying, Do-Chan pleads with Geum to find his father as he has not come home for a week. Returning back to the present, Do-Chan is perplexed at the coincidence of Geum being the same person he met in his childhood. After exchanging formalities, Sa Do-Chan views the exhibits with Geum following behind. Sa Do-Chan comments on various artwork, proving that he is an educated man and not just a law enforcer. Geum asks Do-Chan who is his favorite artist. Sa Do-Chan replies, Wolfgang Amadeus Mozart. Geum laughs at his sense of humor, but Do-Chan confidently explains that when he hears Mozart’s Requiem, he sees the portrait of a man dying painfully. Rather surprised at Do-Chan’s morbid reply, Geum offers Do-Chan tea. 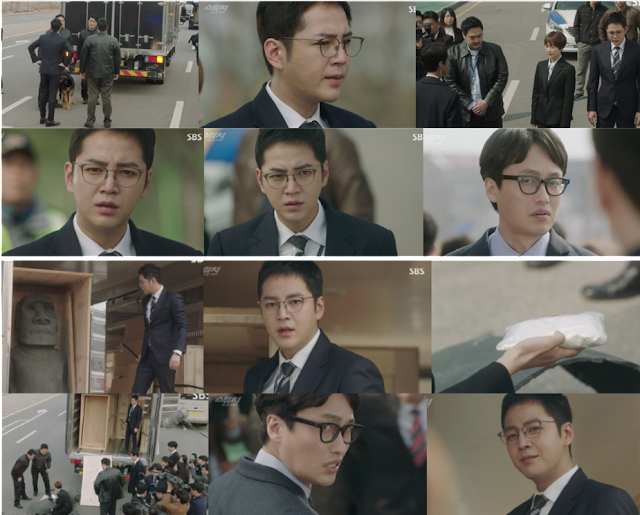 Inside his office, Geum recounts to Do-Chan that he already told Investigator Go everything he knows about Sa Ma-Chun. If Prosecutor Baek is following up on Go, then Sa must be very important. Do-Chan replies that they are just interested in him because he was a famous con artist. He asks Geum if he had ever met Sa. Lying, Geum tells Do-Chan he only saw a photo of his arrest warrant. Having a sense of stalemate, Do-Chan eyes a Janggi board. Breaking the tension, they engage in a game. Geum realizes that Do-Chan is a strategic player and that he has found his match. They both agree to meet again. Later that night, Ha-Ra and Chief Yang arrive at Do-Chan’s apartment. Like most law enforcing careers, overtime is just another aspect of the job. Yang complains that he yearns for the time when his line of work no longer requires overtime. He soon calms down in front of Do-Chan and Joon-Soo, despite the confusion their identities cause him. The chief requests an update about the drugs. Baek informs him that they will not find any at Incheon Airport and that they had used the warrant as a deterrent to simply block one hole the smugglers used. Baek quotes a saying. “A crafty hare has three burrows. When we block other burrows, he will use another one.” Do-Chan is impressed with Baek’s wisdom. Back in the apartment, the team watch the news. President Kang Han-Jib plans to return to Seoul today after visiting Columbia. The last hole Joon-Soo mentions is the President’s private jet. Joon-Soo surmises that because they did not retrieve drugs from the airport, the diplomats must have been informed in advance. They believe this is a golden opportunity to catch Grizzly. Chief Yang strongly opposes the idea, seeing there is no way they would be able to get a warrant for this kind of search. Even if they could get a warrant, how on earth were they to pull off this type of caper? Ha-Ra’s objective is to find the drugs. This con job will provide the evidence they need and redeem them from the mess they are about to create. Their biggest problem now is how to physically stop the presidents convey. Chief Yang remains convinced that they cannot pull it off, but Ha-Ra has greater faith in Sa Do-Chan and suggests that he set this up. All eyes are now on Do-Chan. History has shown that whenever the President was traveling by car, he demands his convey pull over to the side of the road if an ambulance needs to pass. The set up: The team is to use their own ambulance to intercept the presidential convoy. After successfully intercepting the presidential convoy, Sa Do-Chan and Oh-Ha-Ra alight from the ambulance. The president’s security and police escorts approach them with guns ready. Ha-Ra and Do-Chan raise their hands up in a synchronised motion. The Chief Presidential Secretary signals to the police to hold their position while he approaches the prosecutors. With a sign of respect, they introduce themselves and bow. At that moment the President steps out of his car. He is informed that the prosecutors received information that this convoy may be hiding drugs. The Chief Presidential Secretary asks if they have warrant for the search. Oh Ha-Ra quotes the 3rd clause of Article 216 in Criminal Procedure Code: “In case of urgent matters, the prosecutors are allowed to search and seize without a warrant.” Against the strong opposition of the Chief Presidential Secretary, the president allows the inspection. He previously made a press conference declaration that he would remove the corruption in society. He could not be seen going against his own word. He told them that he appreciates their unyielding spirit. 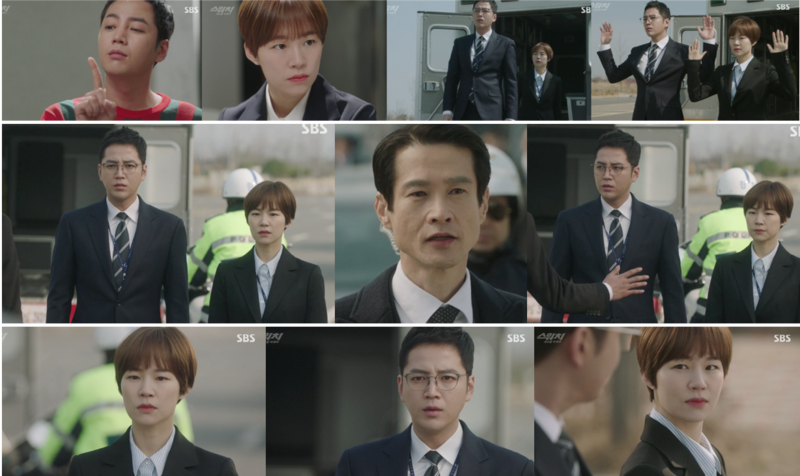 Back in the prosecution office, while Supreme Prosecutor Jung and Prosecutor Jin Kyung-Hee conduct a meeting, Prosecutor Dae-Ro rushes into the office and turns on the news. The report is about their department's search and seize operation. 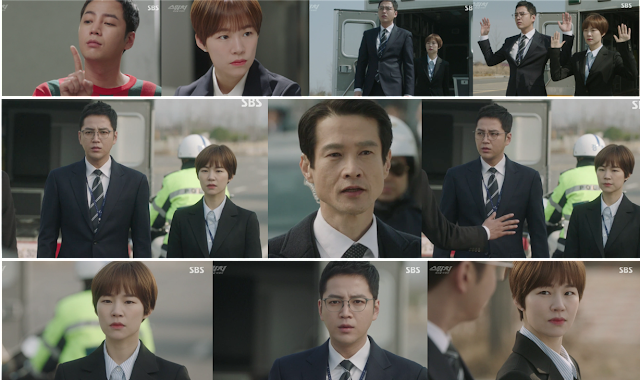 Prosecutor Jin Kyung-Hee assures Jung that she will speak with Chief Yang and runs out of the office. Chief Yang is not in his office, rather he is hiding in the supply closet, praying earnestly for a positive outcome regardless of the result. In the meantime, the investigators search each and every vehicle in the presidential convoy until the only one left is a big container van. Frustration amongst the team sets in. They use a German Shepherd sniffer dog to uncover any drugs that may be present in the van but to no avail. Finally, an officer reports that no drugs exist in the van. The search is a bust. Apologetically, Ha-Ra promises to take full responsibility. The Chief Presidential Secretary threatens that they will lose their jobs. Do-Chan continues to stare at the large crates inside the van. He does not believe Baek is wrong. Baek is too intelligent for that. A bespectacled man from the convoy approaches the Chief Presidential Secretary who seems familiar to Sa Do-Chan. With his photographic memory, Do-Chan remembers seeing this man’s photo in the data they received from diplomat Cha Myung-Soo’s mobile phone. Most of the information obtained from the phone was non consequential, except for one person. The diplomat Cha frequently contacts diplomat Choi Sang-Hyun...the man right in front of Sa Do-Chan. Trusting his instincts, Sa Do-Chan climbs up into the truck and inspects the packages himself. He reads the tag on a big crate, labeled for Diplomatic Package: Choi Sang-Hyun. Catching a crowbar thrown to him by a co-worker, Do-Chan pries open the crate and reveals a sculptured stone head. Exactly like the smashed pieces of the same sculpture wheeled out of the Feel Gallery. With this revelation, Sa Do-Chan pulls the sculpture off the truck, causing it to smash on the ground and break into pieces. While Do-Chan remains standing in the van, the others alternatively look between the broken artwork and Do-Chan. What has he done? How can they fix this? However, Do-Chan has a different view of the situation. He can see the bottom of the sculpture. Lo and behold, packets of drugs hide in the remains of the the broken sculpture. The operation is a success! Choi Sang-Hyun looks at Do-Chan, curling his lip beyond contempt. Approving smiles between Oh Ha-Ra and Sa Do-Chan close the episode.